FABRIC: 51.6% cotton + 48.4% polyester, Lightweight, 230g cotton-blend flannel fabric, open bottom sweatpants for men, this is a warm, comfortable and breathable sweatpants for men. These jogging pants suitable for 4 seasons: winter, spring, autumn. DESIGN: Elastic waistband will not feel uncomfortable, and drawstring sweatpants men lacing can facilitate the adjustment of comfort. Sweatpants pockets can place items, loose trouser legs to make you flexible without restraint. 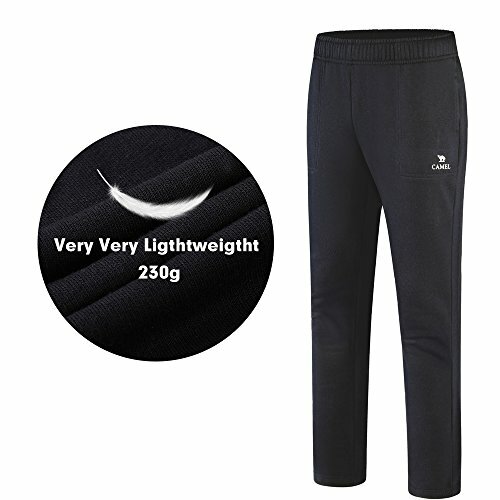 COMFORTABLE: Fleece makes the sweat spread quickly to the outer layer to achieve the effect of dehumidification, which warm and breathe, soft texture, light weight, this men's jogger sweatpants can be used for long-term, more resistant to damage. EASY MAINTENANCE: Resistant to tearing, fade-proof, shrink-proof, pilling-proof, the sweatpants can machine wash and hand wash, it can easy care. Looking as good as new - men's athletic sweatpants. Not too big and not too loose for this men's jogging pants. APPLY TO: Its men's running sweatpants, running pants for men, suitable for running, fitness, walking, bodybuilding, yoga, basketball, football. Joker and fashion, you can be better to show your figure. M - Length: 39.17", Waist: 28.51" L - Length: 40.15", Waist: 29.92" XL - Length: 41.14", Waist: 31.34" XXL- Length: 42.13", Waist: 32.76" XXXL- Length: 43.11", Waist: 34.17"